Celebrating Successes at the AAED Policy Impact Dinner in 2017! Economic development has changed dramatically in the last two decades, and landing a “win” requires cooperation, including the state, county, cities and towns, the business community, and educational institutions, among others. While Arizona may sometimes face challenges when competing on a national and international stage, the state also has tremendous opportunities and has many hard working and caring individuals. The State’s economic outlook is improving and economic developers will not give up. In fact, there are many organizations and elected officials working right now to move the needle, push the envelope, and become more competitive. Our future is indeed bright. 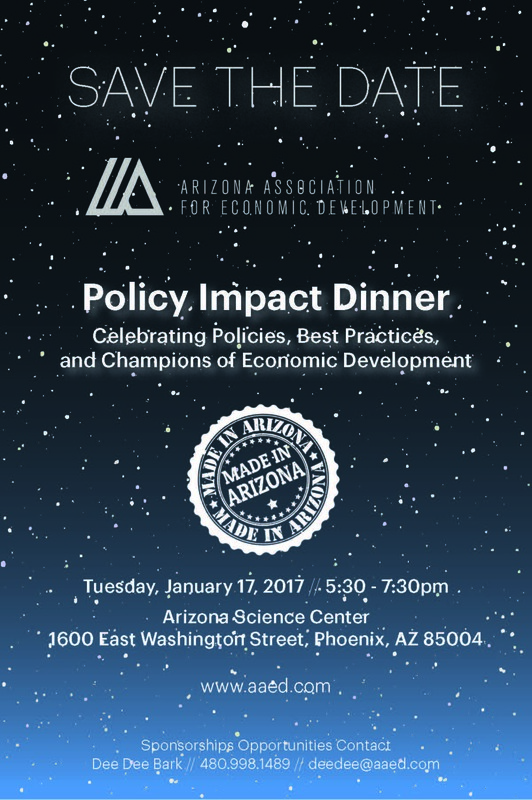 The industry will continue to shine a light on our “wins” during AAED’s Policy Impact Dinner on Tuesday, January 17, 2017, 5:30-7:30pm, at the Arizona Science Center. Attendees will celebrate effective policies, best practices and champions of economic development. The evening promises to be eventful with a legislative awards program, silent auction featuring Made in Arizona items, and poster presentations showcasing the positive economic impact shaping Arizona. Every community is welcome to submit posters and silent auction items. Your participation is needed! Event sponsors at press time include SRP, City of Mesa, Town of Cottonwood, Town of Marana, City of Surprise, Dibble Engineering, and Okland Construction. Additional sponsorships are available by contacting AAED. For details, visit www.aaed.com or call 602.240.2233. Jaye O’Donnell, City of Mesa and Event Chair, is also available for inquiries at jaye.odonnell@mesaaz.gov.